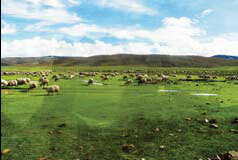 Drekhu pastureland is about 80 kilometers southwest of Yambulakang. As the altitude rises and temperature falls, wheat and Tibetan barley gradually fade away, and the intoxicating fragrance of green grass permeates the air. Situated in the center of the Shannan prefecture and at an average altitude of 4,600 meters, the roughly 2,150-square-kilometer grassland encircled by mighty mountains is truly a beauty to behold. It boasts an array of wildlife, including wild donkeys, horses, gray ducks, eagles and vultures - you name it. The 70-sq-km Drekhu Lake crowns the prairie's center. It's home to an assortment of treasured wildfowl, including the red-crowned crane. The road is quite good, even through the pastureland. Both big buses and small vans can cross it without difficulty. Built in the eighth century, Samye Monastery is Tibet's oldest monastery. It's also the site of the "Great Debate" (AD 792-794) between the Indian Mahayanists and Chinese Zen Buddhists. Founded during the reign of King Trisong Detsen, with the help of the Indian Buddhist masters Padmasambhava and Shantarakshita, the monastery is widely believed to be Tibet's first formal Buddhist monastery. All four major sects of Tibetan Buddhism share presence in Samye. Although only 50 km from the Lhasa airport, the monastery isn't easy to reach. Normally, there are two routes. The two-hour drive from Zedang town along a bumpy, winding mountain path might not be very suitable for the fainthearted. Visitors can also take the hour-long ferry ride across the mighty Yarlung Zangbo River.